The eBook Revolution Podcast goes to Ubud, Bali. 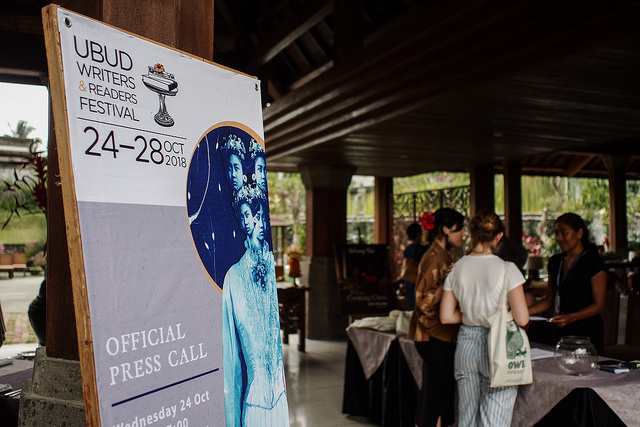 In October 2018, the 15th annual Ubud Writers and Readers Festival gathered writers from Indonesia, Australia, United Kingdom, India, Spain – and all other points of the compass – to attend what has become one of the world’s leading literary and cultural events. I was excited to be a small part of the media contingent in Ubud. My mission? 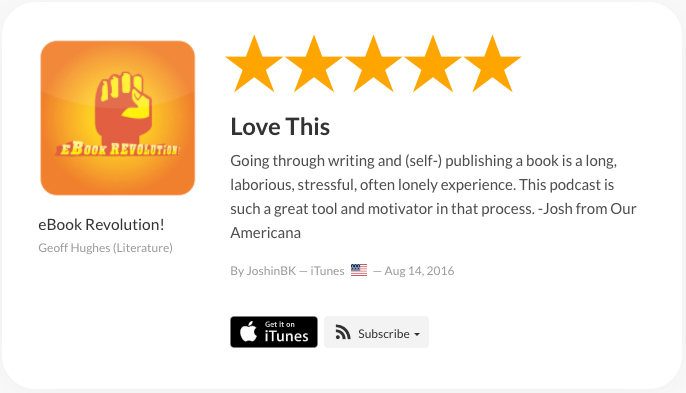 To interview writers about the art and craft of writing for this podcast. 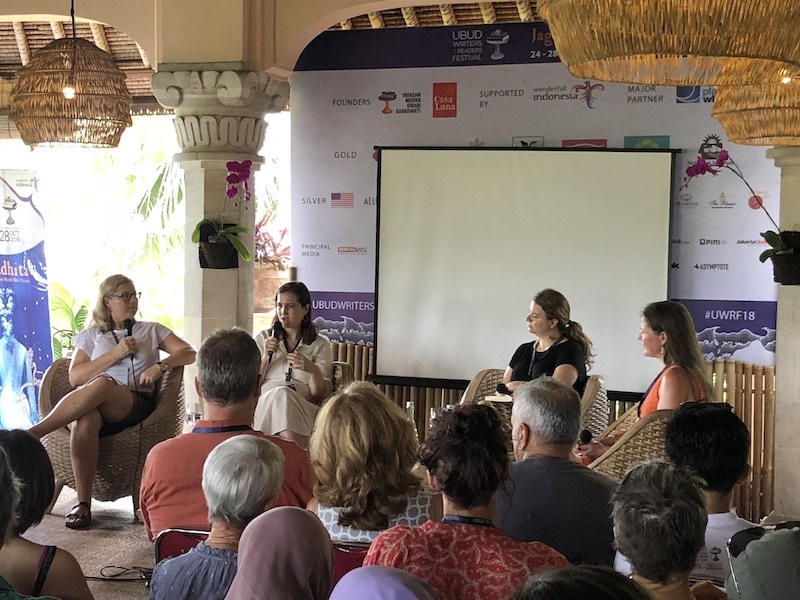 Find out why short stories matter in this special Episode 23 of the eBook Revolution Podcast with Julia Prendergast from the 2018 Ubud Writers and Readers Festival. Using short story competitions as a motivational goal to complete and publish to a deadline. Why you should find windows in your life to pursue your goal of being a writer that are not up for debate. How to give your creative mind its best chance to flourish. How to tackle the ‘virtually impossible’ genre of literary fiction and succeed. Why short stories matter more than ever. Today’s show is sponsored by Amazon Success Toolkit. This toolkit includes step-by-step instruction on how to publish your print book, Kindle eBook, and audiobook using Amazon’s publishing platforms: CreateSpace, Kindle Direct Publishing, and ACX. 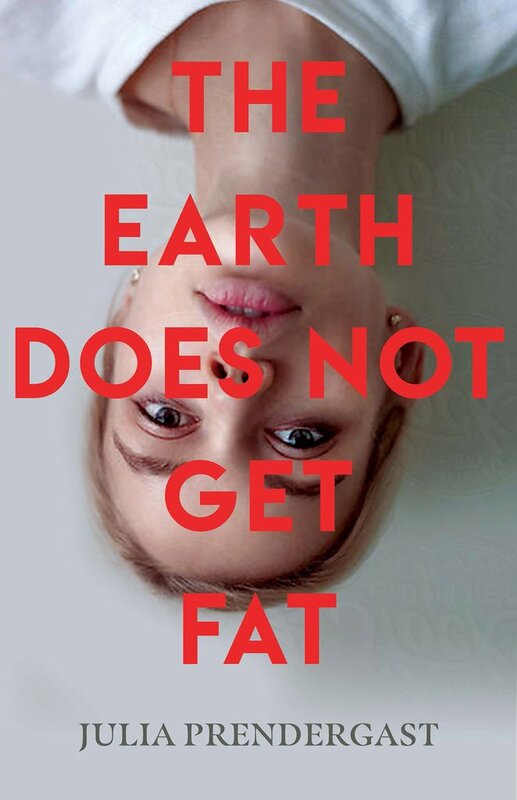 The Earth Does Not Get Fat is Julia’s debut novel, published by UWA Publishing (2018). The story is about silver linings, light in shade. Julia’s recent short stories are included in Australian Short Stories 66, Pascoe Publishing (2018). Julia is a lecturer in Writing and Literature at Swinbourne University Melbourne. Where did the idea for The Earth Does Not Get Fat come from? So many places I suppose. I wrote the first chapter called Sowing the Wind and I originally wrote it as a script and then wrote it as a short story and in that first chapter the protagonist Annie is on the beach with her children – a toddler and an older son – and she falls asleep and when she wakes up the children are missing. I mean the inspiration from the book came from so many places, because in the end, it’s a sort of a behind closed doors story about family, loving, brokenness I suppose. So, tragedy strikes that day on the beach and the story begins 20 years later in the daughter’s voice (who was the toddler at the beach), who’s trying to unravel the story behind her mother’s trauma. Why is her mother so broken and dysfunctional? So yeah, it becomes something else then. So to some extent, it’s informed from family history? I mean, that was just a moment in time. It was just a tiny moment in time for the first story, but I suppose in a broader sense writing about brokenness and writing, loving, dark, darker circumstances and a kind of silver lining and broken families. I’m very interested in kind of gritty realist behind closed doors stories in Australia and and how realist texts can talk about those things. Would you have any advice for writers who want to inform their work through family? Although I teach writing and I give talks to students a lot about craft I think people should write the stories that they can’t not write. In terms of a couple of recent short stories, one in particular that I’ve just finished a draft of, someone read it for me and said – ‘that’s a crazy brave story to write’ -and I thought ‘really?’. You know, I didn’t feel brave, it felt necessary. So I think that anyone who’s writing should really begin by telling stories that they can’t not tell, like what they’re burning to write even if writing is difficult or the subject matter is difficult. Good advice. Of course, you’ve had success with your short stories and you just said you’re a short story addict. Do you think new writers need to tackle the short story form before they embark on the big novel they want to get out? That’s a great question and we were just discussing and debating this at the Australian Short Story Festival, which was just before this festival. (UWRF2018). I don’t think they should. I think that they are a unique form. I think that the short form is a particularly apt vessel for capturing that kind incompleteness of human experience. The missed moment. My oldest son said to me, ‘I can’t understand why you are so, you know, obsessed with short stories. Like we just come to know people and then they go’. I think that’s so very true of everyday experience, even intimate relationships sometimes and people that we think we know very well are riddled with conundrum and contradiction and so we think we know them and then people behave out of character. So I think the short form is a really apt vessel for capturing a moment in time and capturing those missed moments. I don’t like to think that the short form is a practice or lead up, I think they distinct forms. What I’m trying to say the long way around is my novel, you know, three quarters of that work is published as short stories in their own right. So I’ve sort of deviated into writing form. I think short stories and short story competitions are really useful way of creating self imposed deadlines, I still use them. I use writing competitions and then knowing that if something is shortlisted or longlisted that some way it’s got a voice and I’ll have impetus to go back to it. So I used that when I was writing the novel, I polished chapters, so they stood alone and I use that strategically to try to get work out while I was going. So that would be my advice and that’s what has worked as a good strategy for me, but not in terms of training from the short story to the novel, I don’t want to make that claim. I think having a deadline is a good thing. Makes you work. Let’s talk about writing, generally. Do you remember a moment when you understood you needed to be a storyteller? A writer? Gosh, it’s a great question. It’s a big one. I’ve always loved you know, oral storytelling in terms of we know when we engage with people. I love to hear stories about people and think about how the detail of someone’s story adds up, to make a composite picture of who someone is. I’ve always written you know, in my teens, I always wrote but I never wrote for an audience. I never wrote to give. Sometimes I’d share the work with people but I never wrote in the sense of sending out to a publisher, even throughout because I studied writing, I did a degree and then honours, masters, PhD. So even then, when I was studying, writing, and writing more, you know, producing much more material, I still didn’t send my work out for a long time. That’s a good question. I don’t, know. I knew that I wanted to write and I wanted to perfect the craft. I just didn’t feel feel compelled. Maybe I didn’t think the work was ready either. Maybe I didn’t think I had something that was, you know, polished enough or a long enough piece and I was writing poetry. I was writing a decent amount of poetry then, but not poetry that I would have sent out. So sometimes one’s poetry is a way into writing the fictional work, so I’m not sure why, except that I wasn’t burning for publication. I think I just wanted to get the writing right. This is your first novel, The Earth Does Not Get Fat. That’s a great title. It’s from an African saying? It’s an African proverb and it means; however many people are buried in the earth, the earth is never satisfied. It’s the title of one of the chapters and a short story that was published. It’s also a line that comes out in one of the stories in a childhood voice and as a line that comes later in the story from an adult voice, but it also relates thematically to the broader text, which is about loss and about grief and death and how that impacts across the generations. So as the stories grew and the relationships between them grew to fractured telling and multiple first person, that became more central. So I chose that for the title of the book, as well as a chapter. Was it hard to shift gears from writing short stories? When I was writing this novel, I originally thought that I was writing short stories that would exist independently and wouldn’t become a larger work like this, but when I wrote various stories, particularly from the mother’s perspective earlier on, the characters in those stories I felt just wouldn’t rest, wouldn’t leave me alone. So I suppose that’s what I mean, when I said earlier about that, that my feeling is that we should write stories that we that we really feel compelled to write. So even though I thought I was going to leave that story aside and produce something new, I found that in toying with the ideas that I was going back to these characters, so they were still very much alive and that’s how it became a longer work. So it wasn’t so much about shifting gears as about accepting the shape of the work that I obviously had a sense of, without being really aware that I had a sense of it. It always fascinates me how characters seem to just present themselves and situations, almost unconsciously. Yeah, Kafka talks about this, he says, a person standing before two holes in the ground – and it’s a metaphor for writing – and, you know, waiting for apparitions to arise from the left hand hole and instead, they’re constantly distracted by apparitions that arise from the right hand hole so much so that the left hand is eventually closed over. So I’m loosely, very much loosely paraphrasing Kafka there, so I might have got mixed up! But I think it’s a great analogy for writing, in the sense of these kind of ghostly apparitions that we create characters that take on a life of their own and I was talking to students about trusting the judgment – even trusting the uncertainty of allowing the work to to take you where it will. You know that sometimes we can openly meddle and say, “Oh, that’s not where it’s meant to go!” when sometimes I think when you get to the end and you feel like a story, individual short story or big work is finished, you realize you knew a lot more about how it was going to go than you gave yourself credit for knowing. I remember last year, I interviewed a UK writer, Joanna Penn, and she spoke about emergence, just trusting emergence. Yeah. We’re speaking the same language. Yeah. Absolutely. So you’re a lecturer in writing at Swinburne. What do you think a writer can get by studying writing academically? Gosh, so many things. I think, first of all – because I’ve studied writing myself and so I think that it’s such a gift to be exposed to stories that you would not otherwise pick up. So to be exposed to novels and short stories and poetry in such a rich and diverse array of writing – that was definitely a gift for me and I think for students too and I love when students will read for a short story, for example, we’ll discuss it, I’ll unpack what we talked about in the lecture and then, you know, I encourage them to re-read and then some students will come back to say ‘I’ve read that again”. I think writing as a reader and reading as a writer is something I talk about all the time and that’s been the focus of some of these discussions here and I think it’s just crucial because when we read we’re learning all the time, but we’re not sitting there thinking we’re reading ‘rules about writing’, we’re actually just immersed in a story world that teaches us things about our own subject matter and our own craft and what we trust at the level of the sentence and what kind of fictional poetry we want to write like. You know, I love realistic fiction, I’m a bit of a die hard for for dirty realism or realist fiction. So, you know, reading that and seeing how other authors do it well, it’s just inspiring. So I think studying writing gives you exposure to such a vast array of material that I think it perhaps helps you make those decisions a bit more consciously and maybe not consciously but acutely, so you know you’re thinking about different forms and what sort of grounding appeals to you and what you want to produce yourself. When when you embarked on writing The Earth Does Not Get Fat, what is the best advice you received? I think the best advice I received wasn’t so much when I embarked on it but later. Two things Terri-ann White at UWA publishing (University of Western Australia publishing) – who published this work. Before she read the manuscript she said, “literary fiction is virtually impossible”. She was so candid and so sharp and so straight up and I loved that. I agree with Terri-ann and so I thought, well, then what? So if it’s virtually impossible, what am I going to do? Go home and crawl under a rock and cry about it or try and find a window into that kind of virtual impossibility and Terri-ann White, when she read the full manuscript, gave me some great advice about the middle of the novel, where, as I said, it’s short stories, multiple first person mostly in the daughter’s voice at the beginning, and the mothers at the end. In the mid section, there was some other male voices, there’s one that exists – still from from a mother’s past and present – and there were a lot of others and Terri-ann among other people had some questions around that. So the best advice I had was about just about about going back to that midsection with a fresh mind in terms of the overall architecture of the story. So I was glad to have her fresh eyes on them. Following on from that, what advice would you give to young writers just starting out? I just think, you know, if writing something that you feel compelled to, drawn to, then find ways, find windows in it for your life. So from my point of view, I had my children really young so within the tertiary system, in terms of studying, writing was a way for me to stay away from that to make sure that the writing didn’t come last on the list. It was a necessity that I produced material and that I produced theoretical articles about you know, research essays about writing, so while I’m not saying tertiary education is the right way for everyone I’m saying whatever, however, you have to structure your life to find windows for writing that are not up for debate. That if you believe in it, then you find those windows and really you know, it’s tricky. As a mother of young children – and my children aren’t so young anymore, but at that time they were, so finding windows whatever they are. Where writing is where you back yourself when you say “I believe in this and I’m going to have a crack at it”. That’s great advice. We’ll wrap it up. I’ll just round out with one question I’ve asked every writer. Do you have any rituals around writing? (laughs) Oh gosh! you’re saying give it! Give it out! These days I mean, I suppose, I don’t know, I drink gallons of tea! Rituals? I don’t know that I’m a ritual person but I’m definitely a routine person. I tend to try to write, create, do my creative work at the beginning of the day, whenever possible, if I haven’t got lectures straight out but even then, I usually get up early. I’m not a very good sleeper. There’s the truth. Sleeping is not my best thing. So I get up really early and if I know I’m not going to be able to go back to sleep even if it’s like half three or something, I just get ready and go to work. It’s dead quiet and it’s like a ghost university and I do creative work fresh up because I think that connection between your sleeping mind and creative work there’s something kind of precious about that. So if I’ve got a ritual, it’s get there when your mind is the most fresh, Give the creative work your best mind. Great advice! 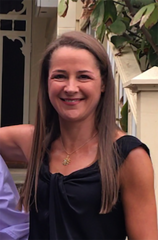 Julia Prendergast, thank you for joining us on the podcast.